Just two weeks ago, we went on a very quick road trip to Arizona. I’d never been before and was hoping to explore some of the vegan options. I wasn’t expecting much, and with the 115° heat, food wasn’t the first thing on my mind when we got there. Still we searched for something different than the usual vegan choices on regular restaurant menus. We were directed by friends to Green in Tempe as the place to check out. Finding some free time on our hands, we made the extra journey to scope it out. As soon as I took a look at the menu and the various vegan items they had for sale in their mini-store I was ecstatic. Not to mention the extensive list of Tsoynami (think vegan blizzard) flavors listed on a chalkboard. 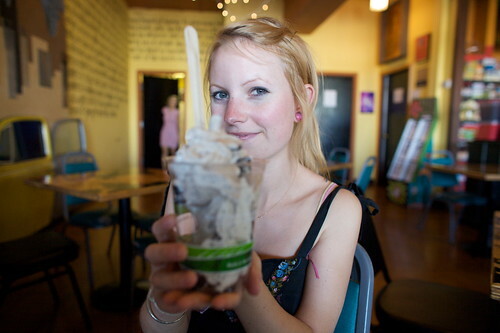 The atmosphere of the place was charming and creative, with tons of space and very vegan vibe. 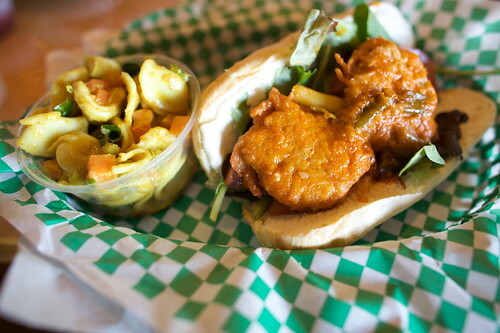 Shawn got the original “g” spicy poboy which was so amazing. Essentially it’s a vegan buffalo chicken sandwich. I want to eat one of these every day. It was spicy but not overwhelmingly so. The mock chicken was the perfect consistency, not overly fried or chewy. I got in big trouble for stealing the last bite of this sandwich. Oops! 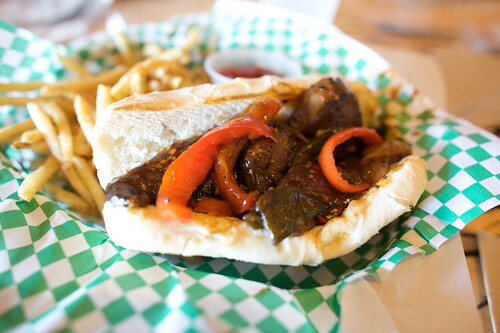 I ordered the texas mooshroom poboy because I was so in love with the idea of espresso bbq sauce. Of course I was so distracted by the idea of mushrooms slathered in bbq that I kind of forgot that I don’t like peppers which this guy is full of. I ended up taking them out and the poboy was damn good anyway. If you like peppers it would probably be fantastic. The thyme fries that came with it were absolutely fantastic. I’m not really one to go nuts over fries, but these were so good, thin and crunchy and flavorful. Let’s be serious here for a second though and talk about this ingenious treat at Green known as a Tsoynami. This is a vegan soft serve dream come true. 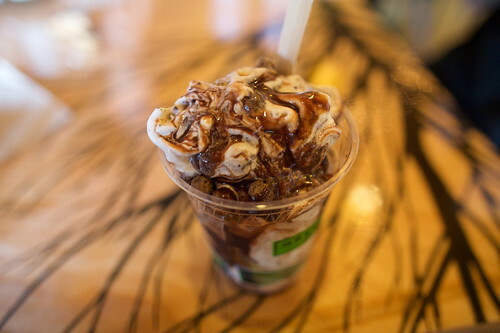 Not only is the soft serve itself creamy and delicious, they have so many items you can mix in you would not believe it. They have a bunch of combinations for you to choose from but you can also choose your own mix ins. Shawn got one with coffee bits, chocolate puffs and chocolate syrup (that I unfortunately forget the name of, but that you can see above). I went for coffee bits and newman-o’s, which is my favorite soft serve combo. Despite the fact that I was stuffed after our lunch, I still gobbled down then entire tsoynami and loved every bite. This is the kind of dessert that doesn’t leave you feeling gross afterward. It’s also perfect for the Arizona heat. These things are 10 times better than a shake or an ice cream sundae. Living in Los Angeles, we’re pretty spoiled with good vegan restaurants, but damn I wish I could go to Green all the time. This is the kind of place with a really nice relaxed atmosphere and artistic decor that we’re missing out on here. There are a ton of places to get great food in LA but not many of them have such a great vibe. Green not only had awesome food and really nice people working there, they also had a bunch of vegan items for sale to go, from Teese to bike tube wallets to recipe coloring books to copies of Earthlings. This is also the kind of restaurant you could take non-vegans to and they would still be thrilled; the food is just great. I can’t wait to go back and try more items off their menu! If you’re ever in the Tempe area you must go here, I insist. i want the Tsoynami so freaking much!!!! there is nothing even close to that delicious sounding in los angeles. JEALOUS. why are these Tsoynamis nowhere to be found in LA??? I have been on the lookout for a good vegan knock-off of a blizzard! Green is absolutely AMAZING. Every time I’m in the Phoenix metro area, I eat at Green exclusively (dinner there every night with take-out for lunches!). The poboy sandwich that Shawn got is my favorite savory item and their Tsoynamis are pretty much the best dessert on earth! I remember making up one with ginger Newman Os that was fantastic. I want to go back to Green now! Yum, your meals look great as do your photos! I am so lucky to live 5 minutes away from Green! That coffee tsoynami is called the Coffee Coco Loco. That’s my favorite there. The Soy Capitan which is strawberries and vegan capitan crunch is sooo good as well. Everything I’ve had from Green is delicious. Come visit us in AZ! going there for my 18th birthday. i hostestly wouldn’t mind living in one of their cupboards for the rest of my life, as long as they’d feed me. My sister in law is in AZ and claims they have some of the best vegan joints around. After reading this article, there may be some truth to it.. Glad to hear you had a great time. I’ve never been. Maybe it’s worth the heat for the great vegan food.